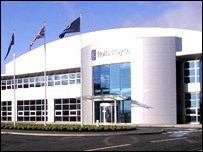 Production at Rolls-Royce's Hillington plant on the outskirts of Glasgow has ended after 65 years. A closing ceremony celebrated the success of the facility, which began producing aircraft engines in 1940. A Rolls-Royce spokesman said the plant played a key role the in Scotland's social history, the World War II war effort and in jet engine development. The firm has now moved production to a £85m state-of-the-art factory at Inchinnan in Renfrewshire. Rolls-Royce management were joined at the ceremony by serving and past employees, including members of the original wartime workforce. Paul McFarlane, general manager for the Hillington and Inchinnan plants, said: "Hillington was the company's first site in Scotland and acted as a catalyst for our growth across the country. "Now operating three main facilities in Renfrewshire, Lanarkshire and Fife, our Scottish sites play a major role in the company's aerospace and marine businesses." Hillington was built in a short space of time just after the outbreak of WWII and almost immediately began producing Merlin engines - which powered, among others, the Spitfire and Hurricane - in huge quantities. After the war, the site repaired and overhauled Merlin and Gryphon engines as well as producing spare parts before switching to the production of the emerging gas turbine engines. In more recent years the facility has produced compressor blades, vanes, seals and shrouds for virtually every engine produced by Rolls-Royce. The Inchinnan site was opened by First Minister Jack McConnell in October 2004.